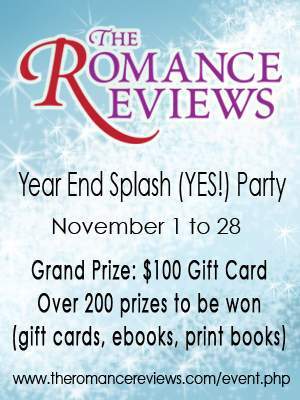 The Romance Reviews “Year End Smash” November 1-28th! Lots of prizes and giveaways! “I never would have thought that such a short story about one stranger rescuing the life of another could win me over so completely. The plot is simple enough, yet it was written so beautifully that it felt as if I’ve never read anything even remotely similar to it…” To read the full review please visit their site. So remember to drop by during the month of November for the Year End Smash and participate to win. If you’re an author who wishes to participate there may still be time, contact Carole, the admin of the site, so you can promote your work as well! Posted in Contests, Events, Giveaways, Writing and Writers. Tagged authors, book contests, book giveaways, ebook giveaways, readers, red haircrow, romance authors, romance readers, writers.